Just regular folks. : The Memorial Day BBQ. 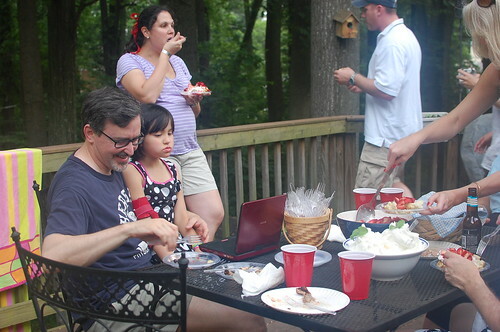 Our neighbors invited us over to their house for the traditional Memorial Day BBQ. There were 4 or 5 other families there and we didn't know any of them and they all knew each other which sometimes can result in feeling left out, but that scenario didn't happen and I really had a great, great time. Everyone was funny and gracious and tender to Edda (who got goodbye kisses on the top of her head) which, you know, always makes me happy.